Somalingappa’s composed face does not pucker as he narrates how, on 20th December 2011, just 40 days into his new job that promised a better pay for his family in Belgaum, his whole world went dark the moment hot liquid metal spurted into his eyes when casting metal at around 1 pm on a work day in a foundry in Kenya, Africa. It took till 3 pm to rush him to a hospital in Nairobi City where they performed an eye surgery to remove the metal shards and sent him on to Mumbai, India, for further medical and surgical treatment. 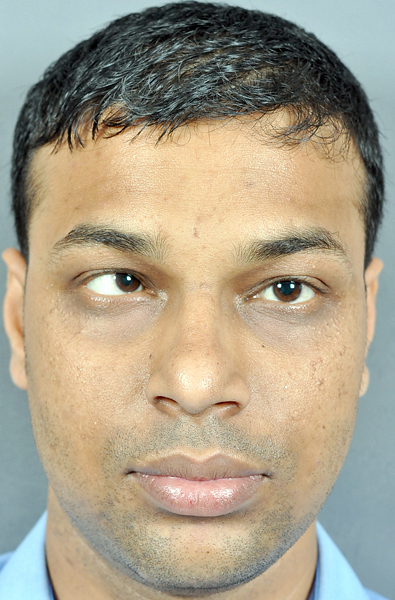 He was operated on for membrane transplantation in Mumbai and for corneal transplantation in both his eyes in Bengaluru. Unfortunately, as infection had set in, his left eye was removed on April 16, 2012. He did not regain vision in his right eye either, and a despairing Somalingappa sought out Dr Virender Sangwan of LVPEI. Dr Sunita Chaurasia operated on the right eye first on 1sr March 2012, to clean the fungus and close the eyelids as a precautionary measure. Six months later, Somalingappa returned to be referred to an in-house clinical psychologist to gauge his stress and undergo counseling sessions, which seemed to have helped somewhat, as he was understandably tensed leading up to the day of the Boston Keratoprosthesis Type II surgery. The sight-restoring eye surgery was performed on 1 Feb 2013, to coincide with the visit of an American doctor, Professor Dr James Chodosh from Harvard Medical Centre, USA. When the eye was cleaned on the day after surgery, and the sutures held the eyelids closed together, Somalingappa joyously states that through the gaps in the sutures he was able to see two fingers held up in a victory sign, and three days later when the eyelids were cleaned in the outpatient clinic, he could make out the face of his doctor too, again through the gaps. To be able to see again after all hope was lost, was indeed an emotional moment. Never did Bonny Gideon and his wife Nagamani imagine that the tiny hands that they held to teach baby steps would be leading them in future. The Gideon couple suffers from vision related problems; Bonny has cataract and several other vision related problems, and Nagamani suffers from night blindness. Their condition is irreversible. They hail from Pangidigudem village in Jangareddy mandal of West Godavari district and Bonny works as an assistant for an NGO. On the advice of some well wishers, they had been coming to the Sight Enhancement services department of L V Prasad Eye Institute in Visakhapatnam. During this time, about three years ago, they became proud parents of a baby daughter who they named Smiley. But, when they were told that the baby had cataract, their dreams came crashing down at the thought of their child facing the same fate that they suffered. The doctors in Nidadavolu whom they consulted first, suggested that they take their baby to LVPEI. Smiley was brought to the institute at the age of four months. 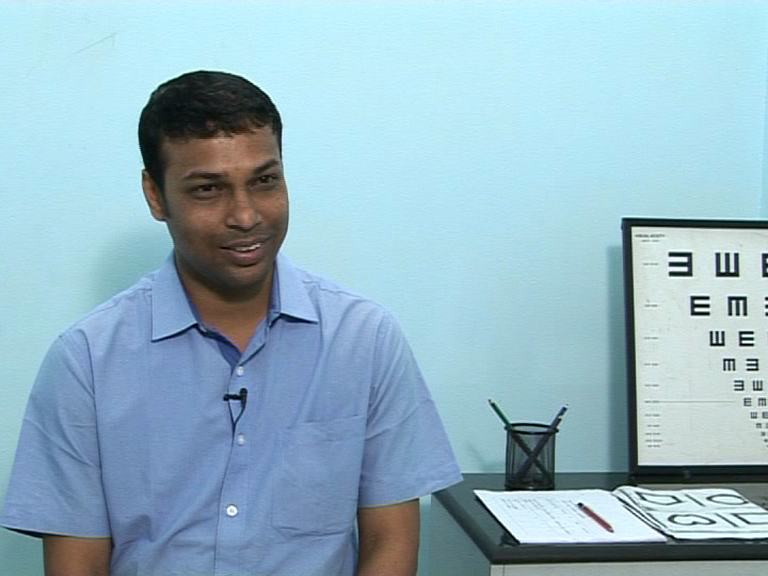 When Dr. Avinash Pathengay saw them in the OPD, he stopped by to enquire about their well-being. When he heard that they were there not for themselves, but for their tiny bundle of joy, they were reassured about her vision. “They were very supportive and two surgeries were performed on Smiley. She is using vision correcting glasses on the doctors’ advice, is attending school and helping her mother after returning home. She reads the names of places and the numbers on the bus for us when we go out. She talks incessantly about the posters on the walls, and tells us about whatever is happening around us all along our way. She is the anchor to our lives; she is our eyes,” says the happy father. Fatima, just 2 years old, was peering into a bowl of vegetables, while her mother Matluba was cooking. As Matluba poured some vinegar into the dish, it suddenly splattered and damaged both the eyes of little Fatima. Fatima’s father Gholam is a Russian businessman, based in Tashkent, Uzbekistan, a fruit wholesaler. The despairing Gholam took Fatima to several doctors, but to no avail. Dr Akshay Khera, an Indian ophthalmologist settled in Tashkent, advised Gholam to take the child to L V Prasad Eye Institute. Gholam looked up LVPEI on the internet and began corresponding with the institute. The family arrived at LVPEI in Hyderabad in June 2012. Gholam recalls, “After I met Dr Sangwan and he said that he could help my daughter see again, there were tears in my eyes, tears of joy.” Fatima was operated upon in June 2012; a Boston Keratoprosthesis lens was implanted in her left eye. The response was good. Back home in Tashkent, Dr Khera provided Fatima post-operative care. Gholam and the family returned to Hyderabad in January 2013 to attend to Fatima’s right eye. Earlier, the doctors at LVPEI had thought that the same type of surgery may not work for the child’s right eye as it was severely damaged by the hot vinegar. On this visit, she was re-examined under anesthesia by both the cornea and the glaucoma specialist, who then decided to go ahead with the same kind of surgery. Fatima underwent a Boston Keratoprosthesis lens implant in the right eye and is doing well. She waved goodbye cheerfully, as she was returning home with her parents who were more than pleased for her. 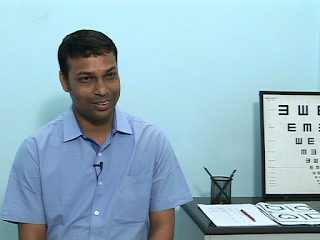 Dr Rajiv Das is training to be an ophthalmologist in Dibrugarh in Assam. He grew up with a squint, amidst the prevailing social belief that a squint was a harbinger of good fortune. Had his parents been advised to take him to a squint specialist for a surgery, preferably before the age of 6, Rajiv would have been able to see with both eyes. He wouldn’t have grown up a diffident student and a retiring husband, rarely accompanying his wife to social events. On a visit to LVPEI to attend Eye-PEP 2012, a conference for postgraduates in ophthalmology, Rajiv decided to take the plunge and underwent surgery on 6 October 2012 to correct his squint. At 31, he knew that the correction would be merely cosmetic and vision could not be restored in his bad eye. But his eyes would be aligned, giving him a new look. 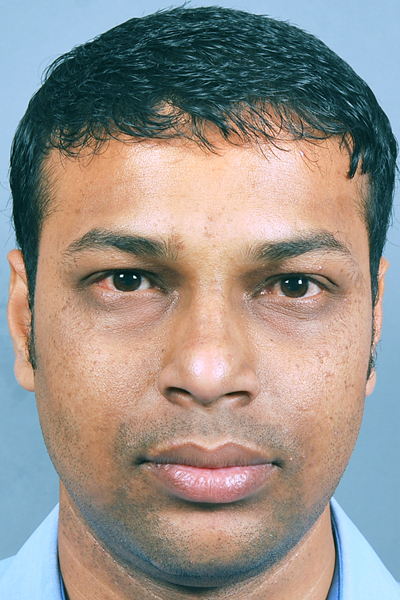 Dr Rajiv Das, MR P694423: Pre and post squint surgery; and the now smiling, confident oculoplasty aspirant.